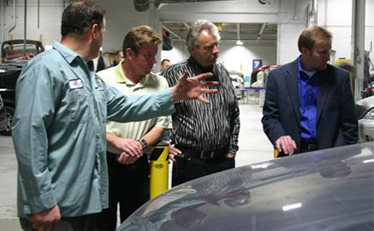 Chip Foose, world famous custom car designer and builder, stopped by Rick’s Auto Body for a tour of our facility, and to meet our team. Chip was very impressed with our state of the art equipment and dedicated staff. He was very gracious and met every member of our team. They discussed autobody repair and custom car building. Chip posed for many pictures and signed lots of autographs.